Can recycled vinyl be re-purposed? Is vinyl a good thermal product? What should I look for when buying windows? What is a “normal” window warranty? What is an Energy Star window? How do I clean Fiberglass and Steel Doors? How do I remove scuff marks on painted finishes? If finish is accidentally scratched or chipped, how should I clean it? How do I protect my door’s finish? How do I clean door hardware? How often do I have to clean my gas fireplace and vent? Why do logs collect soot? How do I clean my gas logs? What do I do if one of my gas logs breaks? How do I clean the glass doors of my fireplace? What is a safety pilot? What is required to use a remote control? What is required to use a wall switch? Can glass fireplace doors be closed when gas logs are burning? With gas logs, do I need the damper open all the time? Can I use chlorine bleach to clean my canvas awning? What is the most commonly used glass? How do I keep my shower door clean? Vinyl is a superior product to wood in windows. It saves trees, there is no wood rot, vinyl holds color longer than wood, it doesn’t require harmful paints or stains, the product life cycle is longer than wood and there is lower consumption/replacement. Yes! Vinyl offers superior thermal efficiency which do not deteriorate over time. Benefits include better air ventilation, reduced mold and mildew. Key points to look for are insulated frames, fusion-welded corners and energy-efficient glass. Window manufacturers offer a wide range of warranties. Some are as short as 5 years, many are 10 years, and a few offer a lifetime warranty. Windows with Energy Star ratings means they have been approved by the US Department of Energy for outstanding energy efficiency. 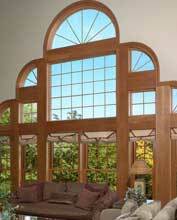 All of Sheboygan Falls Glass windows carry the Energy Star seal. Wash with mild soap and water, rinse with clear water and wipe dry. Keep weatherstrip clean of dirt and grit for proper seal. Wash with mild soap and water, rinse with clear water and wipe dry. Apply a light coat of wax (i.e. Pledge) and wipe off excess. Use mild liquid cleanser (such as Soft Scrub® by Clorox), rinse with clear water and wipe dry. Clean as recommended above and use touch-up paint supplied or standard wood finish repair crayon. For painted doors, clean door then spray and wipe with protectant (such as Armor-All). For stained finishes, periodic painting with a non-yellowing clear coat paint is recommended for doors exposed to severe weather conditions. Much like sterling silver, even the finest brass will react naturally to the elements surrounding it. To maintain, polish with a non-abrasive automotive or furniture wax. By keeping your hardware cleaned and maintained you will be rewarded with a long-lasting finish. Although the frequency of your fireplace servicing and maintenance will depend on use and the type of installation, you should have a qualified service technician perform an appliance check-up at the beginning of each heating season. Sooting is a result of impingement caused by incomplete combustion, i.e. flames coming in contact with a surface, cooling the flame, and preventing combustion. Never, ever wash your logs. Remove the logs carefully from the fireplace in a box, take them outside and use a soft brush or vacuum to clean them. Make sure you replace the logs exactly as they were originally placed. We recommend taking a digital photo prior to removing your fireplace logs. Contact Us. Do not use your fireplace until your log set is complete and placed properly. Operating the fireplace without a complete log set, or if improperly placed, can cause sooting. It is very important to clean your glass after the initial 3 hours of burn time. Failure to do so can cause permanent etching of your glass. If applicable, turn off the gas. Make sure your glass is completely cooled. Remove the front face or louvers of your fireplace. Carefully remove the glass assembly of your fireplace (following the instructions in your manual) and lay it on a soft surface. Wipe both sides with household glass cleaner (do not use a product with ammonia), using a soft cloth. For heavy deposits, use Stove Bright Glass Cleaner, Rutland White Off Glass Cleaner, or other hard water deposit glass cleaner. Carefully replace glass on front of fireplace (following the instructions in your manual), making sure glass assembly and front are secured. After this initial cleaning, clean your glass as often as necessary, particularly if adding new ember material. Never use any abrasive cleaners or cloths to clean your glass. Scratching can cause the glass to shatter. A safety pilot prevents the flow of gas when the appliance is not in use. A remote control and/or wall switch requires a Millivolt valve system. The wall switch requires low voltage electrical wiring. Can the glass doors on my fireplace be closed when my gas logs are burning? No. You must leave the doors open when you are operating RealWood Elite gas logs to avoid damaging the controls. Yes. When the logs are in use the damper must be fully open. A damper clamp will come standard with your gas log set and MUST be installed to maintain a small opening at all times. This allows for the escape of any pilot exhaust. No. Never use products containing chlorine bleach when cleaning a canvas awning, since bleach will rot the fabric. Scrub canvas using a gentle soap. Continue scrubbing until soap bubbles do not turn dirty looking. If the soap is dirty, rinse, reapply soap, and scrub again until the soap looks clean. Always rinse thoroughly until all of the soap is gone. Remember that wet canvas can still look dirty. When it dries completely, it will be evident that it is clean. Clear glass is the most popular selection made today. It allows you to showcase your shower and creates the illusion of a larger bath. Clear glass works particularly well with the frameless and all glass enclosures. A wide variety of pattern glasses are also available to add a decorative touch to the bathroom. Pattern glass will obscure your view into the shower hiding soaps, shampoos, toys and build up. The best way to keep any shower door clean is to wipe it down after every use using a squeegee or towel. In addition to wiping down the doors after each use, once a week clean the glass and metal with a quality, ammonia-free glass cleaner. The type of metal on the door will determine what cleaners are safe. On anodized aluminum finishes, we recommend Davie’s Glass Cleaner. Bruce’s Glass Stain Remover works well on neglected shower doors with water and soap build up. It removes water spots, shampoos and soap scum off glass, aluminum, tile, porcelain, and chrome. After cleaning, apply Clear Shield surface protectant. It works well on glass, porcelain, ceramics, fiberglass, chrome, stainless steel, Formica, marble, anodized aluminum, and other hard to maintain surfaces throughout the home. Invisible Shield is long lasting, and repeated use of the product will not discolor surfaces and will not crack, peel, or build up. Proper cleaning of your shower door will extend the life of your enclosure and make it the centerpiece of any bathroom.